I finally completed the Everest of all bedroom designs here at our new house. 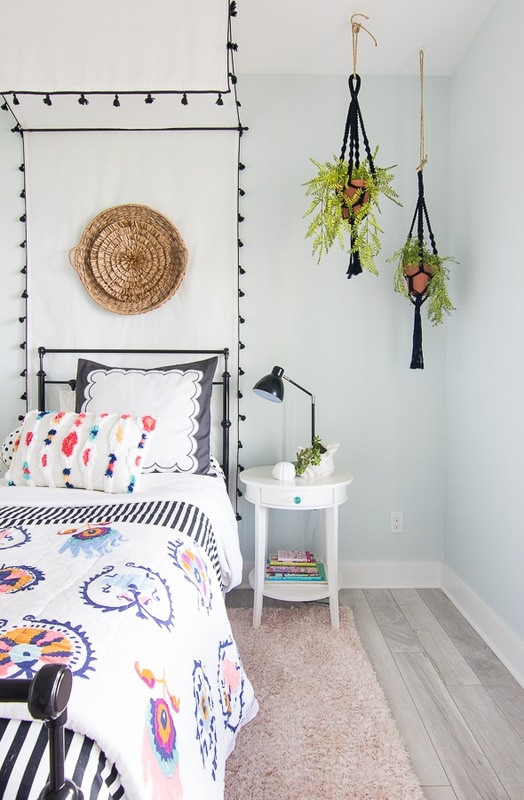 My tween girl beachy boho bedroom. Or at least it started off boho, now it’s morphed into boho/black & white/vintage beachy/put a pompom on everything and call it a day. 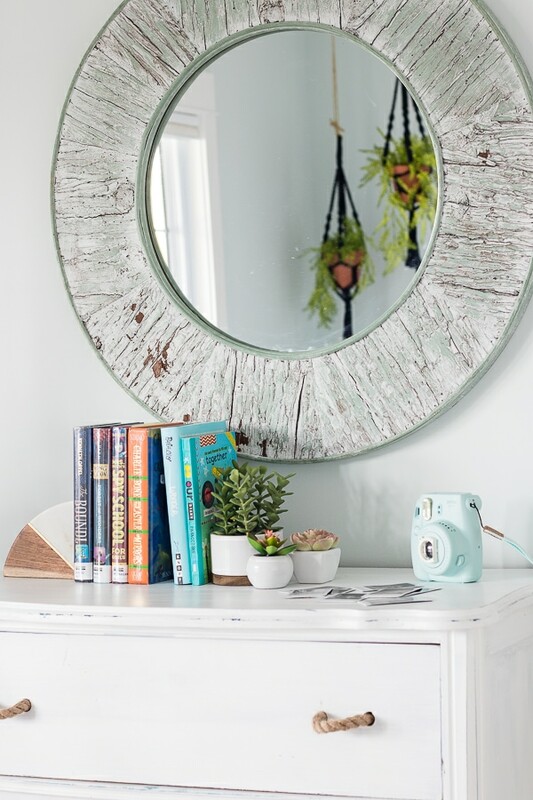 My 10 year old daughter likes to change her clothes at least 3 times a day, so that should have clued me in that decorating her room was going to be an ever evolving process. 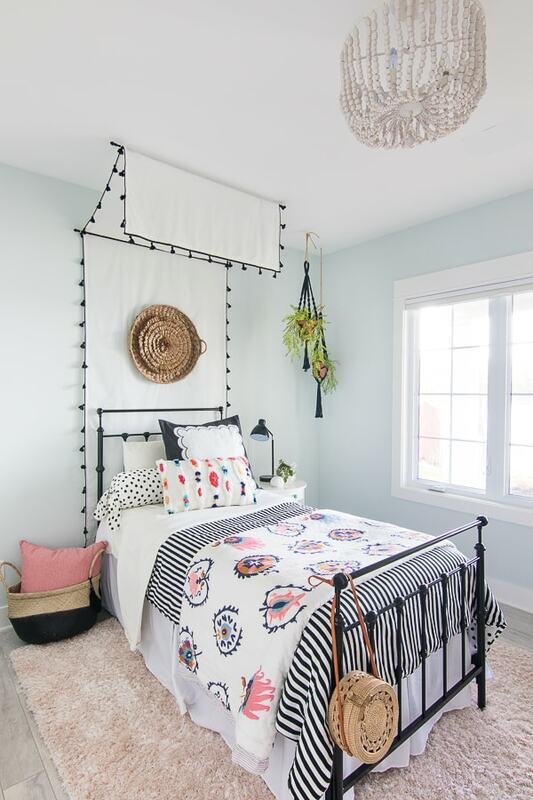 First she wanted aqua walls and colorful boho bedding, cue the cute anthropologie quilt at the end of her bed. Then she decided black and white was her new must have decor trend. Thankfully I found this striped PB Teen duvet cover on sale along with some cute black and white pillows to add in the mix. 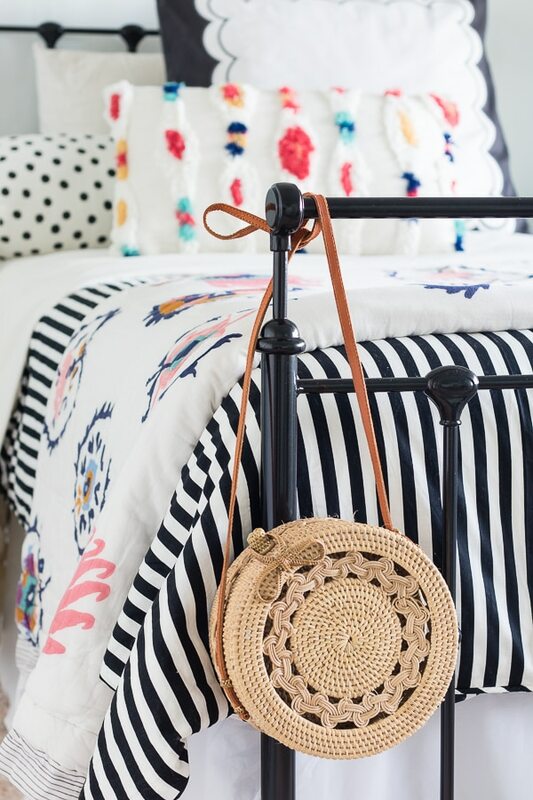 Boho – check! Black and white – check! But wait, she also really misses her Papa and Gigi down in Florida, so wouldn’t it be cool if it felt like the beach in here?? 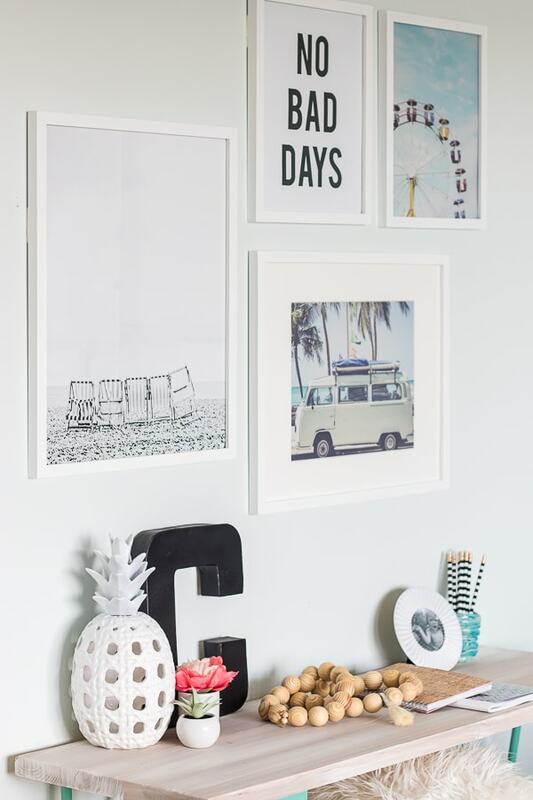 Picture this request with bright blue puppy dog eyes… Here comes the cute vintage beachy wall art gallery. Beach house vibes – check! And just when I thought we were in the home stretch, she mentioned she really missed her canopy in her old room. Which was actually just what the room was missing (she gets it from her mama). My awesome mother-in-law helped me sew 2 PB Teen drapes together to make this canopy. I think I’ll do a tutorial on how we made it soon, if you guys would be interested in that? 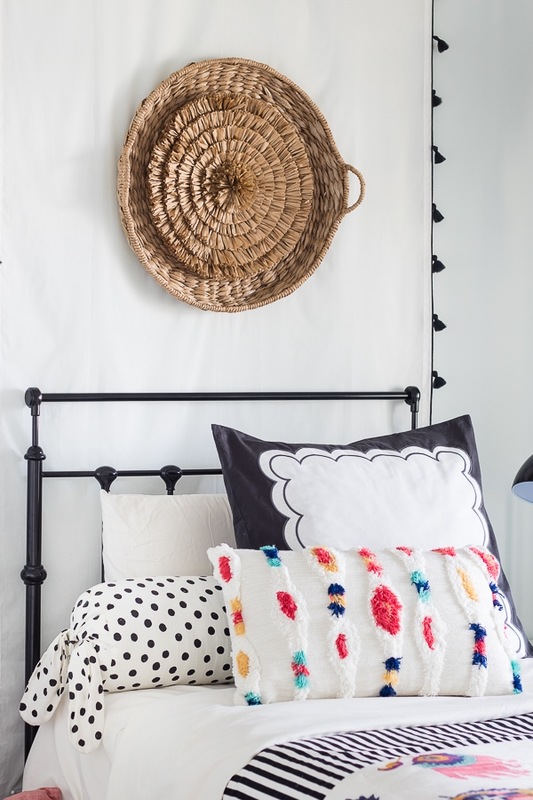 So boho/black & white/vintage beachy/topped off with a canopy and we are all smiles around here! I found this dresser at a local flea market for $30 and it had these cute rope pulls which fit right in with our laid back vibe. She loves to keep her weekly rotation of library books up here on the dresser along with her favorite polaroids of friends and Charlie (our pup). Let’s also pretend I remembered to clean the mirror. Her desk was a fun Hobby Lobby find on clearance. I did a bit of a white wash over the wood top, because it was a yellow toned pine. We dropped a little more $$ on her furry yoga ball chair. Which I sold the Mr. on, because it’s supposed to help her concentrate when she does her homework. She’s getting straight A’s so I’m gonna go ahead and give some credit to her bouncing around like a lunatic while doing math facts. Of course her favorite thing in the room is her hanging chair/flying trapeze. I actually bought this when we were building, so the guys built extra support up in the ceiling joists to hang this swing. We hung it with a heavy duty porch swing bolt and it can handle up to 400 lbs. Which is a good thing, because my kids have an entire circus act they do on this thing, and yes my walls have the dents to show for it. I originally bought this sort of straw flower looking puff thing from Hobby Lobby to hang above there, but it was too small on it’s own. 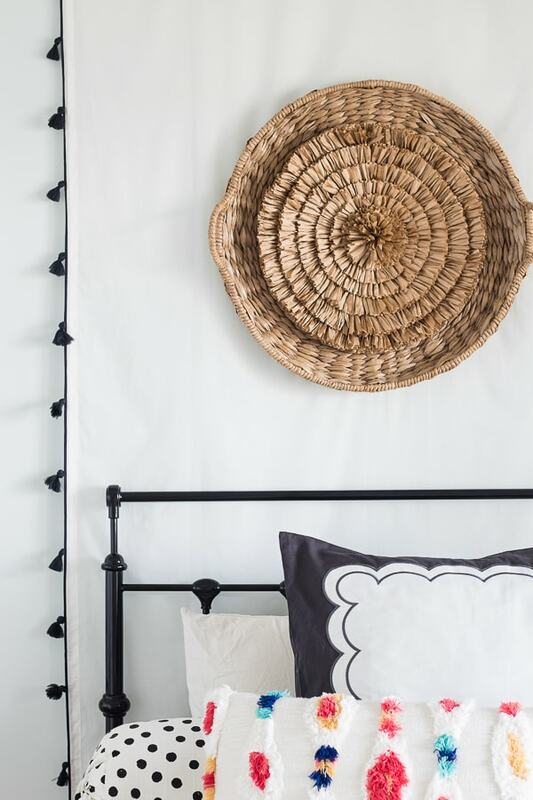 I love the texture it adds layered over the basket and it makes it the perfect size. I added these hanging plants in the corner for a little pop of life. Normally I’m a total plant lady, but these are really good faux greens. I didn’t want to deal with watering and dripping all over the floor. Not to mention the last time I gave her a real plant she drowned it every day until it finally cried uncle. Thanks Sarah, this was a fun one! I really like the layers of texture. Please post tutorial on the fringed canopy. Your daughter is lucky to have a creative, open-minded Momma!! 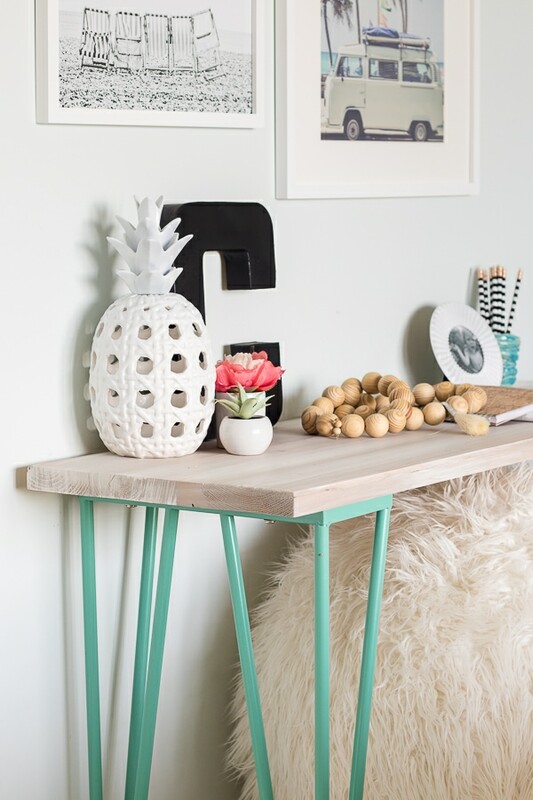 So fabulous for a girl’s bedroom! Yes, do post a how-to on the canopy (my boys are grown but their friends have daughters, and I have hope 😄), because it and the swinging chair really top off the room. Your daughter’s friends will be envious. They do all love that chair! I will definitely post a tutorial maybe tomorrow? Glad you are coming home next week mom! My daughter has been begging for aqua/teal walls and, and I couldn’t settle on a color that I (not her, haha!) could live with. But I love this! You are such a talented designer!! 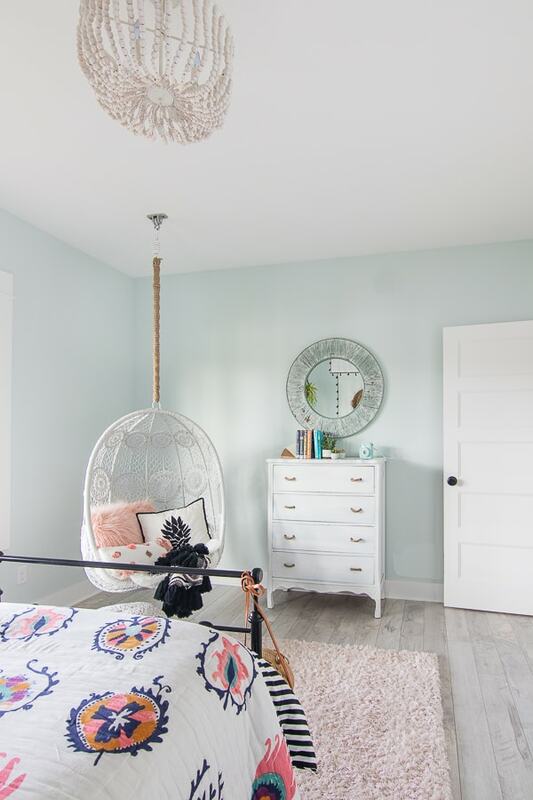 My daughter has been begging for aqua/teal walls, and I couldn’t settle on a color that I (not her, haha!) could live with. But I love this! You are such a talented designer!! My daughter loved the teal vibe, but she loved black too!! So we did 2 walls teal and 2 walls a dark silvery gray. Her duvet cover was PB black and white and we put teal pillows on the bed. She LOVED IT!! OH that sounds like a fun room too! This is beautiful! Can you share where you found greenery for the hanging plants that looks so realistic? It’s from a local store called Flowerland, it’s where I buy all my real plants too! I’m sorry but I want this for myself. It is absolutely beautiful and perfect! Haha I definitely hang out in there as often as she will let me :) the chair is so fun! Looks amazing!! I would love to know where the greenery came from that’s in the hanging planters. It’s from a local store called Flowerland, they have an amazing greenhouse where I buy all my real plants but they also carry really good silk flowers. I’m not sure if I included a photo of her closet door but she has a big walk in closet that is a disaster and filled with toys! Also the basket next to her bed is kind of her catchall bucket where she tosses toys and craft stuff etc. Love this fun post! You made it all come together! Thanks Stacy, it took a while but we made it work! 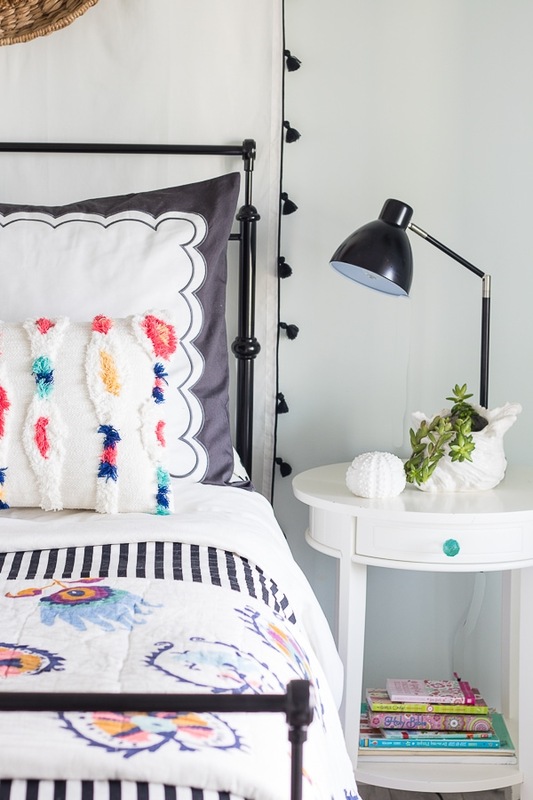 Kelly, your daughter’s room is way too beautiful. The swigging chair is gorgeous. And indeed the other articles too. Especially the pillow covers and the rug. Your interior is brilliant. Your sense of interior is just awesome can you please suggest me something. Recently I’ve got the interior of my entire house. Reds, strong blues and vibrant greens in particular. Please suggest me the best Area Rug, as I have a wooden Dining table in my dining room with vintage cutlery set and blue color painted walls, Suggest me something which goes absolute fabulous with this combination. I’ve been purchasing the rugs from https://www.therugmall.com/8-x-10-area-rugs-best-rugs-to-buy-in-usa/ they have the great collection of rugs. so fun, and fresh. You were able to get all her “must haves” and still made it so tasteful and lovely. One of my favorite kids rooms ever! It wouldn’t have been my first choice either but she loves it! Beautiful. Fits in perfect with rest of house! Glad your young gal is doing straight A’s! So fun and girly with an added touch of sophistication! Love it! That black accenting against the Top Sail blue is perfect. Thanks Nicole, I wasn’t sure about the black and white at first but it ended up working out so well!